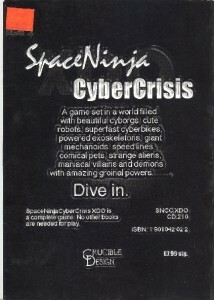 Crucible Design’s game “Space Ninja Cyber Crisis XDO” showed designer Matt Johnson’s role-playing game vision of the future. In fairness, I don’t know how much he felt would actually be coming to pass, and how much was just awesome stuff he gleaned from Anime and Manga. However, what is fascinating is just how much “fantasy” from 1997, when the game was published, is crawling towards reality. For me, the future I always wanted featured state of the art cosmetics. Really! The secretary in “Total Recall” painting her nails by touching them with a pen, or Promise from Steven Barnes’ “Street Lethal” novel who has synthetic skin and hair that she can have light up in a variety of ways, for me these were the promises of the future. Screw flying cars I say, I want affordable high tech cosmetics! It’s doubtful it will be easy and affordable in my lifetime, but “Boffins in America are working on biodegradable, flexible electronic devices printed on silk, which could be implanted in the human body and would decay naturally over time. Applications could include LED displays inlaid beneath the skin.” Go future! Many, including Avery Brooks up there, want flying cars. I’m not sure why, a car accident is scary enough without crashing and then falling out of the sky. But that must just be me. What a difference 10 years can make Avery, because flying cars are on their way. Of course these aren’t your running errands in the city flying cars, but if we end up with those, these will have been their great, great, grandfathers. The futures that Avery Brooks and I were hoping for are hovering (literally in the case of potential flying cars) on the horizon. We’re also seeing some of Matt Johnson’s future too. Remember the description from the first part of this? “A game set in a world filled with beautiful cyborgs, cute robots, superfast cyberbikes, powered exoskeletons, giant mechanoids, speed lines, comical pets, strange aliens, maniacal villains and demons with amazing groinal powers…..” Click on those links my friends! 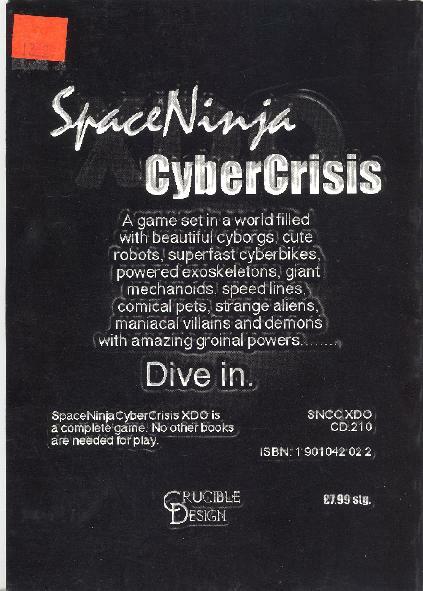 Surprisingly, the setting for Space Ninja Cyber Crisis XDO, is slowly evolving into reality. Regardless of our wishes, the future always arrives. Avery Brooks’ flying cars, my electronic tattoos, and Matt Johnson’s SNCC XDO, were once our fanciful musings and now we’re seeing them newly created, to one day become the primitive ancestors of tomorrow’s common place. This isn’t an endorsement or condemnation of what seems to be blossoming on the horizon, it’s just a realization made while flipping through a role-playing game book.